Why is the Kenmore 28042 Upright Freezer the #1 Bestseller? The Kenmore 28042 upright freezer sits at the coveted #1 position of the Kenmore upright freezers bestsellers' list. So, why is it a shopper's favorite? Well, it has quite a few pluses going for it in the capacity, storage options, security, design and price departments. External dimensions are important because you need to know whether the freezer will get through the doorway or hallway and whether it will fit in its designated spot. Honestly, if the freezer can't be installed, it's of no use and is a waste of money. So these dimensions are that important. So grab your tape measure and note book and jot down the measurements of the doorway, hallway and the destination spot for the freezer. If all is well, come and read the rest of the page. If it isn't, check out a slightly smaller Kenmore upright freezer, perhaps a 16.7 cu. ft. fellow bestseller? The Kenmore 28042's 20.6 cu. ft. capacity can hold up to an unbelievable 721 lbs. of frozen food. That's tons and tons of storage space, even by a large family's standards. Make the most of this space by reducing your trips to the store, saving precious time. Or to rake in some decent savings by buying whole primal cuts of beef or pork and packing them into meal-sized steak and roast portions yourself. 4 spacious, fixed shelves provide the bulk of storage space, and are made of wire for extra durability. 5 door bins transform the door into more than just a shutter. What's more, they are movable and even adjustable, making them a source of customizable storage for short, tall and oddly shaped items. So whether you need to store bulk purchases on a long term basis or party supplies temporarily, this Kenmore upright is equipped for the gamut of freezing jobs. A slide out basket is great for storing tiny items—such as a veggie pack—that would otherwise slip through or get trapped in the wire shelves. This Kenmore freezer also comes with a soft-freeze zone that is designed to remain slightly warmer than the rest of the freezer. As such, it's best for keeping ice out of your ice cream and your butter and whipped toppings mellow and ready to eat when you are. Food costs money. Obvious? I know. But when you lose food, you lose money, right? OK. I guess the point really is that there is no point investing money (and time) to shop and stock up your freezer, only for some unauthorized people to unjustly reap the hard-earned fruits of your labor. So, if you can't exactly vouch for your neighbors' integrity, it's probably a good idea to protect your food by investing in a lockable freezer such as the Kenmore 28042. And believe me, that's quite a deterrent. Because your neighbors will have to qualify as locksmiths before they access your food. Mechanical controls for those of us who still feel intimidated by digital controls and backlit LCDs (whatever that stands for!). A manual defrost system for those who think the virtues of this type of freezer far outweigh the tedium of manually defrosting it. True, this freezer only consumes 526 kWh of electricity in an entire year. And while it is not certified as an Energy Star, it only cost $56 to operate each year or just $4.67 each month. As such, it is in effect, far more energy efficient than identically-sized Energy Star frost free upright freezers. And, it also sports a security lock—because we can't afford to lose multiple 700-pound hauls of food to inconsiderate pilferers! This upright freezer's price point points to its no-frills design. So it's an all-white freezer—cabinet, door and handle. To their credit, white appliances are easy to keep clean and they certainly help to brighten up the kitchen. Plus, the door has a textured finish, which adds a touch of style to a decidedly minimalist design. Kenmore stands by this design and backs up all Kenmore 28042 units with a one year limited warranty. This means that all defective parts and poor workmanship that existed at the time of purchase will be remedied by Kenmore, free of charge to you. Oprah, the billionaire queen of daytime TV (and of inspiration, too) once famously said that she checks price tags before buying anything. So who are we lesser mortals not to? Especially when we are looking to buy big-ticket items like freezers. But it is the cheapest of all the 20.6 cu. ft. Kenmore upright freezers. And, given its potential to save time and money, it can pay for itself in months, not years. So yes, it is good value for money. 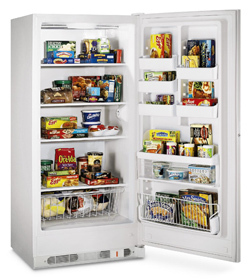 The Kenmore 28042 offers a surprisingly large storage capacity and versatile food organization at an affordable price. And the security lock is a welcome bonus. This winning combination makes it a dream freezer for the price-conscious shopper who is looking for a large upright freezer.